Since a while Citrix has released XenDesktop 7 the successor of XenDesktop 5. 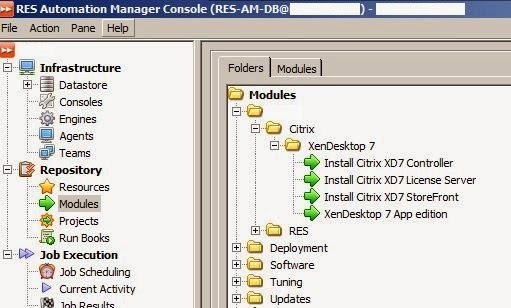 With XenDesktop 7 comes a successor of XenApp 6.5 hence the number 7 in the version. 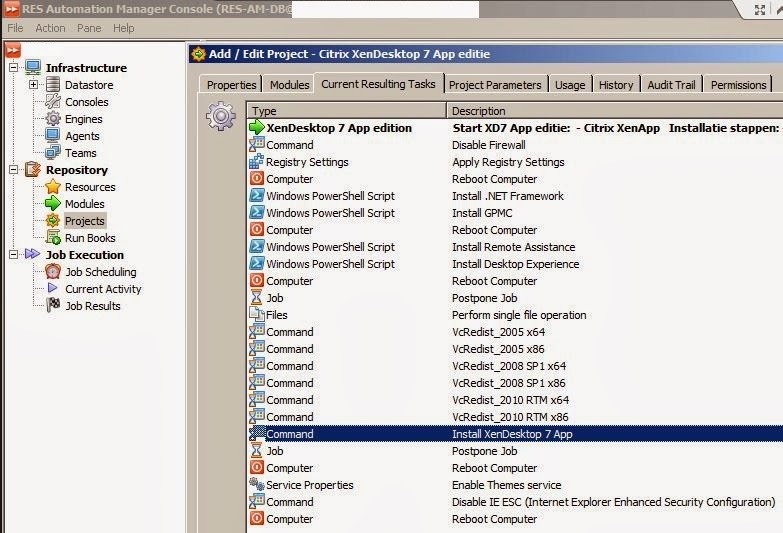 This blog while show you a real life impression of XenDesktop 7 App edition the new XenApp. As told before XenDesktop 7 came from a merge of XenDesktop 5 and XenApp 6.5. The version 7 was logical because XenApp had to have a follow up and no one wanted to re-release version 6. My year started with a new project where we implemented a SBC environment for a customer currently on Presentation server 4.5. 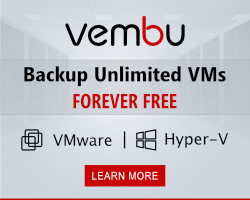 We had the choice to implement XenApp 6.5 or go with XenDesktop 7, it was a choice between experience and newest edition. We decided for XenDesktop 7. I’ve created an automated installation of Citrix XenApp 6.5 with a few co-workers a while ago, it was quiet a job to get the timing right. Now with XenDesktop 7 I faced the same issue, I had to automate the installation and was worried about that I would be busy with fixing timing issues. Installation of XenDesktop 7 App edition is really nothing more than the VDA agent. On the Citrix server, besides services, there is no clue of it being a SBC server. 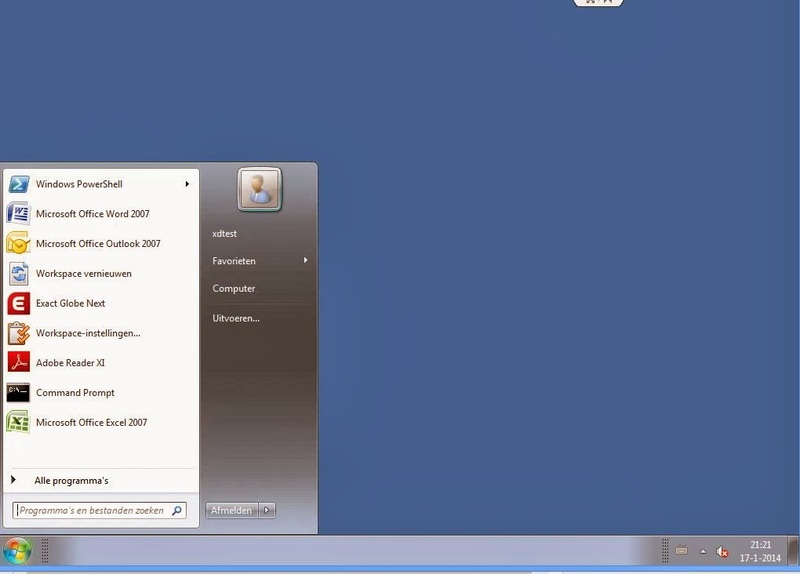 The automation was done with RES Automation Manager, a very easy product to automate any IT task. As you can see the job isn’t that complex, a few roles and a few VcRedist versions and you’re done. The job took a total of 28 minutes to complete from start to finish, I think that’s pretty neat. I created jobs for all Citrix components and deployed the whole environment in less than three hours. After the initial deployment we ran a tuning job to tune the server and a base set of applications. In total the server was ready for testing within the hour. The installation was a breeze, a few cups of coffee and we were done. Next was the installation, besides the databases you need to configure most is done from the Studio console. I’ve been skeptic about Citrix for a while because of the many consoles they had, there was no real integration, all products seemed to run next to each other without any coherence. Now with XenDesktop 7 I have to say they’ve done a good job, management of VDI and SBC is done from one console. 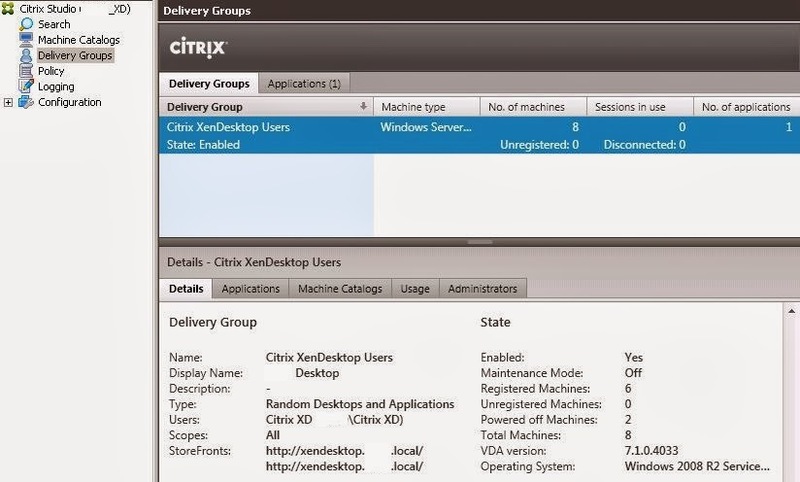 As you can see we created a XenDesktop server catalog with 8 machines. With the App edition you don’t have access to Provisioning server, my first choice of deployment, so we went for MCS. When you select “View Machines” all servers show up and you can see the status of the servers. One issue I have with this screen is that you can’t see what the actual status is when you are updating the servers. You can select which columns you want in the screen but even then you can’t see the status of the updates. From this part of the console you can also update the image after you created the master image. There is not hassle with the master image like before no xenappprep or anything like that. Just create your master server, shut it down and go to the update wizard. The wizard will create a new snapshot and deploy the XenApp (should we still call them like this?) servers from that. 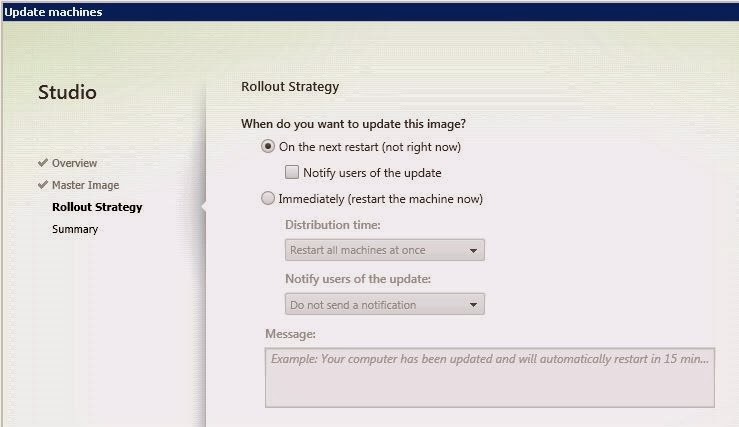 From the wizard you can select when you want to restart the servers when updating. For this project we were still building the environment and therefore restarting isn’t an issue. Next in the console are the delivery groups, from this location you publish applications and a desktop. At first this might look a bit strange for it’s far from what we are all used to, the old console and wizard are all gone. When we look at the properties of the delivery group you can see that you can select what you want to publish. 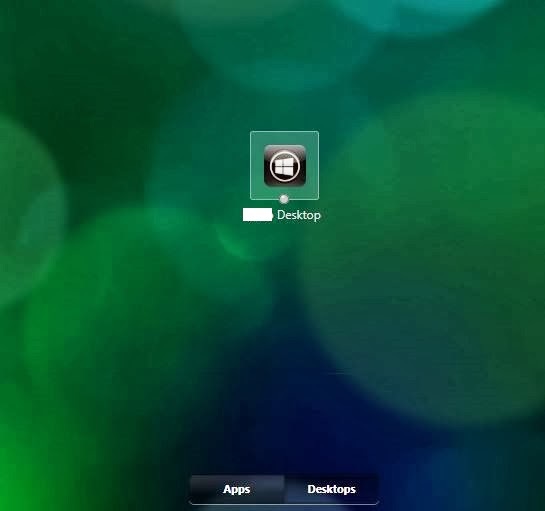 We can choose whether we want to publish desktops and applications or just one of those. Next up is the setting the color depth and time zone and so on. Don’t think you would set any other settings than in this screenshot below. 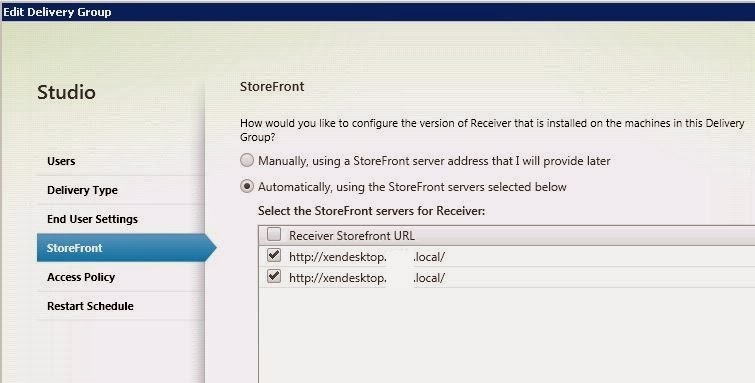 Next in the delivery group you can select how the receiver is updated, of course we selected the storefront servers. Automatic configuration is the easiest way to configure the clients the other way is to do it manual. The access policy can be set but at this moment we don’t have any running yet.. as soon as we have this screen will change. 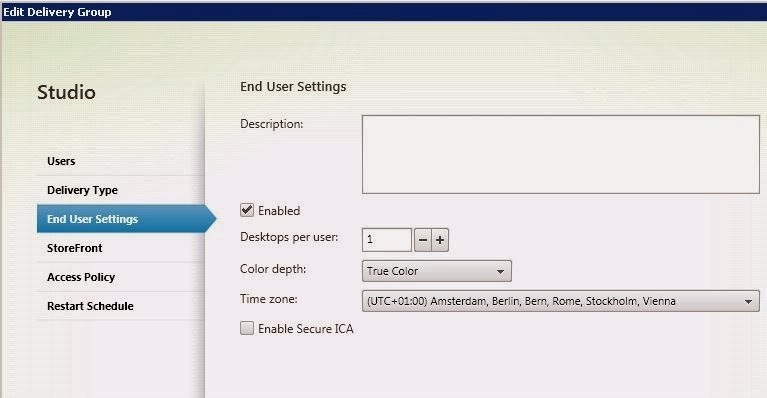 You can select which users can connect to the desktop and which not. 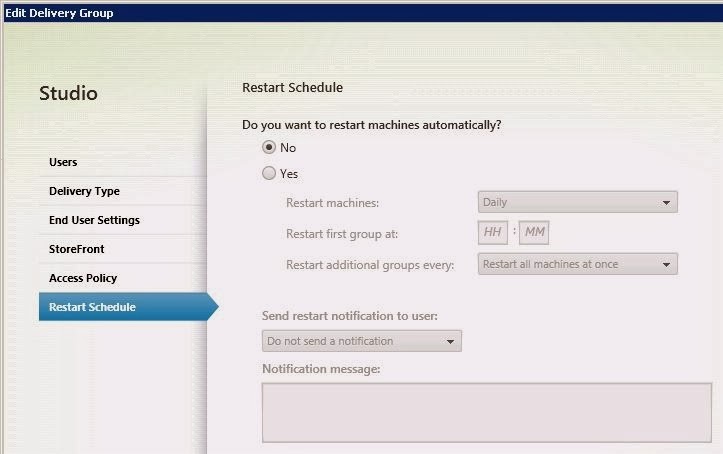 At last you can set the reboot schedule, pretty important in a non-persistent XenApp environment when you want to make sure the server reboot at a certain time so that they become pristine again. Of course next to this you need to setup the vSphere connection to the vCenter server. For that like before you need to create a domain user with vSphere rights. I haven’t added screenshots for that because nothing has changed there. The same goes for licensing that hasn’t changed except for the fact that Citrix has done a nasty Microsoft like trick and deprecated the advanced license for customers that go to the App edition from any XenApp Advanced license. The customers have to pay a huge price to upgrade a really bad situation imho. 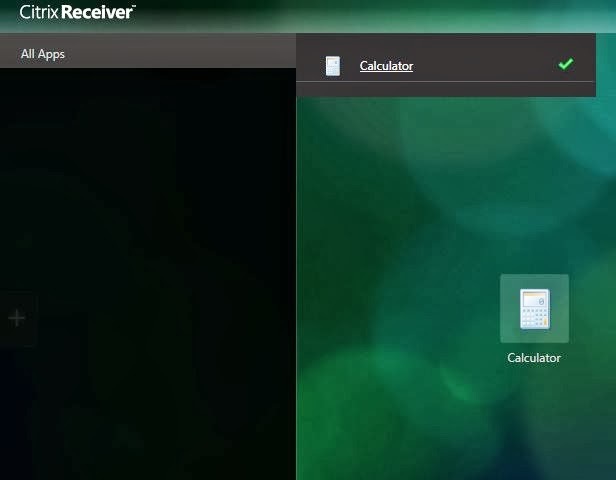 When you setup the connections, the licenses and stuff, created the catalog and delivery group, you can open the browser and start the desktop. With the new storefront implementation we end up with the screen as shown above… still without configuration the initial screen loading is damn slow. 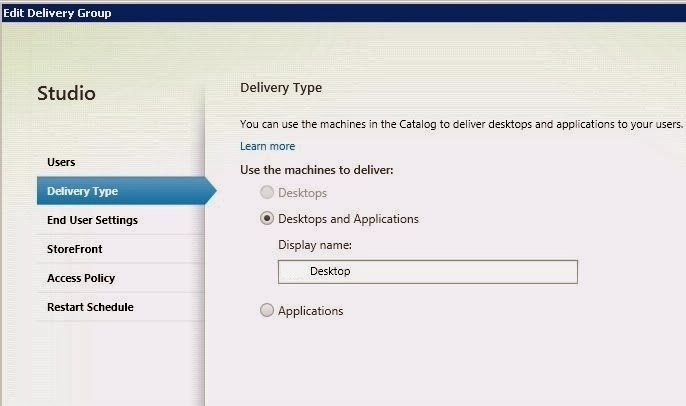 We have one delivery group and so there is one desktop available, as you can see there is also an option for apps on the same screen, we can configure how this is displayed. When you click the Apps button a + appears on the left side of the screen allowing you to add application to your screen, a kind of app store for your users. they can select themselves which apps they want on their screen. We only added Calculator as of now. I have to say that Citrix has come a long way and created a very nice product, much better than the previous versions that were not that nice to manage. Setup is fast and easy and can be done pretty fast without much trouble. The only down side of the new version when working with MCS is that you can’t see when your updated servers are ready after updating. it would be nice that their was a console item that told you that they arr ready for users to connect. The other issue is the licensing but if you follow me on twitter you know my feeling about that. Hope this blog gives you some insight in the new product, when new interesting features are available I’ll post them here.